3 of 21: Should you use vitamin supplements with DS? Can Vitamins and Diet affect the Health of Children and Adults with Down's Syndrome? Please note that none of the following should be construed as medical advice, and does not represent the opinion or policy of Beannachar Ltd.
Having attended a conference in London organised by the Down's Syndrome Research Foundation (http://www.dsrf-uk.org) and subsequently investigated the matter together with the doctors at the Camphill Medical Practice, Aberdeen, I write this article in order to gather together the current trends in the understanding and treatment of people with Down's Syndrome using a method called T.N.I. (Targeted Nutritional Intervention). TNI consists of taking food supplements containing vitamins, minerals, digestive enzymes and amino acids, as well as certain oils rich in essential fatty acids. Dr. Karl Koenig, the founder of the Camphill movement, was deeply connected to children with Down's Syndrome and wrote a book (in German) on the subject: Der Mongolismus. (Mongolism), the term formerly used to describe what is nowadays known as Down's Syndrome) He was partly inspired by the work of Dr. Haubold in Germany, who was one of the pioneers of nutritional therapy. Dr. Koenig treated many children with vitamin C, emulsions of vitamins A and E and a mineral supplement with trace elements. According to Dr. Koenig's observations over many years, children to whom he gave the supplements were generally stronger and healthier than those coming newly into his care. Although this article is intended to raise awareness of these recent trends, it is not meant to be a final word on the subject. It is known, for example that social and intellectual stimulation for children with special needs is vital for their development and physical well being, and that these factors are at least as important as physical measures that are presented here. It has often been observed that people with Down's Syndrome become stronger and healthier when they are part of a lively and stimulating social/cultural environment. It is also known, that disharmony, for example marital tensions in the immediate environment, can bring about a degree of confusion and sadness that their physical health suffers. The whole question of digestive weakness could also be studied and treated in other ways, for example using natural medicines. The main speakers at the London conference were doctors and researchers from the US and Canada. Conventional understanding of Down's Syndrome has lead us to believe that it is a genetic disorder that is a fait accompli, and that therefore there is little more that can be done to help the situation. There can easily arise an attitude of just accepting that they are who they are, and not much more can be or needs to be done. They usually do not present much of a problem, and in many cases get stuck in a convenient slot within an institution or community. A small group of motivated parents and doctors in the USA and Canada claim to have demonstrated that if nutritional intervention is started early enough the growth rate and cognitive development might be normalised, and many of the physical and mental features of Down's partially prevented or improved. Those who begin early enough claim their children even avoid the physical characteristics typical of the syndrome. Photographic evidence presented at the conference showed dramatic changes in facial features and general bearing among treated children. (Please note that no one is suggesting that supplements should be taken to change anyone's facial features.) 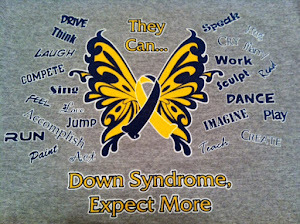 In Down's Syndrome there is an extra 21st chromosome leading to a genetic overload. Doctors call it Trisomy 21 (meaning that instead of two number 21 chromosomes ('somy'), the Down's person has three ('tri'). As genes create enzymes and proteins, this extra chromosome, which then occurs in each cell in the body, causes a number of metabolic imbalances due to too many enzymes and proteins. These may be factors leading to the typical Down's characteristics: the underdeveloped nose, the Asiatic facial appearance, small growth, waddled gait, difficulty in running, sparse straight hair, underdeveloped jaws, flattened upper lip, oftentimes short-sightedness or crossed eyes, and the floppy, rag doll feel. One could liken Down's Syndrome to a cake recipe with too many ingredients. The idea is that 'short' ingredients can be added to balance out the 'extra' ingredients. In other words, nutrition can be used to compensate for the genetic overdose. Researchers continue to discover that Down's children share similar metabolic disturbances. The heart of the problem is abnormal levels of antioxidant enzymes - too little catalase is produced and the three (instead of two) chromosomes 21 produce one and a half times as much of the enzyme superoxide dismutase (SOD) as normal. This causes a profound disturbance of the antioxidant defence system. Ordinarily, levels of SOD, whose job is to mop up free radicals and convert them to hydrogen peroxide, exist in subtle harmony with catalase and glutathione peroxidase. But where there is too much SOD produced, the body overproduces hydrogen peroxide, which builds up in the cells, and breaks down further into more free radicals. When there aren't enough antioxidant enzymes to detoxify this H2O2, the dietary antioxidants we take in as food must finish the job. The most important dietary antioxidants are vitamins A, C and E, beta-carotene, co-enzyme Q and the minerals zinc and selenium. (Beta-carotene is provitamin A and is an important antioxidant.) Some studies have shown that children and adults with Down's Syndrome exhibit deficiencies of the antioxidant nutrients vitamin A, E, C, zinc, selenium and glutathione. According to Dr. Lester Packer of the University of California, (author of 'The Antioxidant Miracle') coenzyme Q and lipoic acid are also vital to what he calls the 'antioxidant network'. According to his research, the major antioxidants work intrinsically together and work better when they are taken together. Further, research has shown that when the major antioxidants are given to people with Down's Syndrome, they disappear from the blood much more rapidly than usual. With low levels of antioxidants, free radical production runs riot in each cell, causing problems with many major bodily functions, especially the immune system. Oxidative free radicals are chemical entities that are often found in the cell environment; being highly reactive, they can cause serious damage within the cell. They are found in larger amounts as a result of pollution, smoke, e.g. from barbecues or cigarettes, radiation, ozone, and even stress. In a normal person, these are fairly effectively inactivated by a series of enzymes and anti-oxidant vitamins. It seems that this mechanism in the Down's Syndrome metabolism is deficient, and the excess of free radicals causes damage to enzymes, DNA and the cell wall. The damage to the cell wall is of particular consequence for the brain and nervous system, where it causes loss of the transmission of nerve impulses and a more rapid than normal loss of neurones in the brain (apoptosis). This can result in a wide variety of effects from poor motor coordination, low IQ to memory loss and the early onset of dementia (Alzheimer's disease) which is very often the case with people with Down's Syndrome. The cell wall is predominantly lipid (fatty) substance. The brain is also predominantly composed of lipid substance, the most common of which is docosahexaenoic acid (DHA), a highly unsaturated omega 3 fatty acid. By including in the diet the correct essential fatty acids, such as omega 3 unsaturated oil as found in flax seed (linseed) oil as well as DHA, found in fish oils, the damage to the cell walls caused by the free radicals can be more rapidly repaired. This is vital if progressive brain degeneration is to be avoided. The typical physical appearance of the brain of a 40 year old person with Down's Syndrome has the same characteristics as that of a person with Alzheimer's disease, even if dementia is not present. Trials have shown that vitamin E, one of the most powerful antioxidants known, is effective in delaying the onset of Alzheimer's disease and maintaining memory function in old age. It is well known that People with Down's Syndrome have a greater incidence of infections, which is largely due to the poorly functioning immune system. This could be caused by caused by oxidative stress (excess of oxidative free radicals) and low levels of antioxidants. With a normal diet, the typically inadequate levels of antioxidant vitamins are being rapidly used up, which leads to low blood levels. The person with Down's Syndrome probably needs a higher intake of these nutrients in order to maintain adequate blood levels and a healthy immune system. Independent research has shown that vitamins A, C and E, zinc and selenium all help to improve resistance to infection. It is interesting to note that many of the symptoms of vitamin A deficiency can be seen in people with Down's Syndrome i.e. depressed immune system, dry skin and mucous membranes, night blindness and defective teeth. Other researchers have found lower blood levels of B vitamins in people with Down's Syndrome. One of the main functions of the B group of vitamins is to maintain the healthy function of the nervous system. TNI contains a broad spectrum of B vitamins. In some versions, a night time dose of vitamin B6 together with essential amino acids is intended to stimulate the growth hormone in sleep, in order to improve growth. Diet: Some research in the USA has shown that most children with Down's Syndrome are lactose-intolerant, and do better on a milk-free diet (although some dairy products like yoghurt are better tolerated.) Milk also contains vitamin D2, which is not well tolerated. Dr Koenig advocated a low-dairy diet for them. It is known that milk products increase the production of mucous, which can increase nasal congestion and the tendency to bronchial infections. Doctors in Germany have reported that post-mortem examinations performed on people with Down's Syndrome brought to light many cases of advanced bronchial infections which had not been previously diagnosed. Also, significantly more people with Down's syndrome than average are gluten intolerant, i.e. have coeliac disease. This results in damage to the lining of the small intestine, poor absorption of vital nutrients and severe digestion disorders. This can be tested for, and if found to be the case, then complete avoidance of wheat, rye, barley and oats is the only known treatment. Further, a diet high in damaged fats and margarine can result in reduced levels of all essential fatty acids, which are vital for a healthy nervous system. Cold pressed, unrefined oils such as olive, sunflower and linseed are infinitely better than the depleted supermarket oils and margarine. Organic butter is also an excellent source of good fats and vitamins. People with Down's Syndrome often have a weaker digestion than the general population which can result in malabsorption of foodstuffs including vitamins etc. It is likely that larger quantities of essential nutrients need to be given than normal. Most versions of T.N.I. include digestive enzymes, which help with the correct digestion of carbohydrates, proteins and fats. It also includes specific amino acids (the building blocks of proteins) in order to compensate for digestive weakness and to supply those, which may be lacking. Leukaemia: There is a higher incidence of leukaemia in D.S., and it has been demonstrated that this can be reduced by antioxidants. Thyroid Activity: Many Down's children also evidence abnormal thyroid activity even at birth; one per cent show signs of hypothyroidism which rises up to 10 per cent in childhood. This is 28 times more frequent than in the general population. Untreated hypothyroidism can cause speech and hearing defects. However, this may have something to do with low levels of zinc. One study demonstrated that zinc affects the metabolism of thyroid hormones in children with Down's Syndrome. Once given zinc and other supplements, the thyroid stimulating hormone and thyroxine levels normalised. N.B. It is very important to have regular thyroid tests done especially if TNI is given, as this can alter the thyroid status, and thyroxine doses (if taken) usually have to be reduced once supplementation is given. Nutritional Therapy (T.N.I. ): The pioneer of the nutritional approach in America was Dr Henry Turkel, who developed his programme more than 50 years ago. Dr Turkel developed a programme he called his 'U series' - a compilation of vitamins, minerals, digestive enzymes, essential fatty acids, amino acids and several drugs, including thyroid hormone. He managed to get approval to sell his programmed in Michigan and treated some 5,000 patients, reputedly with some success. T.N.I. must not be confused with Megavitamin therapy, which gave vitamins a bad name by using massive doses at unsafe levels. The current recommendation for therapy consists of administering a supplement containing a broad spectrum of vitamins, minerals, amino acids and digestive enzymes, at doses close to or slightly higher than recommended daily allowances, but well within recognised safe limits. MSB plus is available from Nutrichem in Canada; Nutrivene from America and "Euro-TNS" from Beannachar (see below for details.) The supplements are specifically tailor-made for the needs of the person with Down's Syndrome. It is recommended to have regular blood and urine tests performed to determine the individual's metabolic needs. The company Nutrichem can also further customise the formulation to the individual requirements. DHA can be supplemented at 300 to 400mg daily, or 20mg per Kg of body weight. This substance is one of the vital natural ingredients in breast milk that is essential for the correct maintenance of the cell walls of the nerves of the brain and retina that are so readily damaged by free radicals. The availability of DHA is now considered the main reason why breast-fed children have a higher I.Q. and lower incidence of schizophrenia than non-breast-fed. It would be important for expectant and breast-feeding mothers to ensure that they have a high enough intake of DHA. DHA is also present in oily fish, and to a lesser degree in some meats and eggs. It is also present many proprietary brands of fish oils. One of the best sources of omega 3 fatty acids. It helps to maintain the integrity of the cell walls that are easily damaged by the high levels of free radicals. The body can produce a certain amount of DHA from flaxseed oil and other oils high in linolenic acid. Flax seed oil can be supplemented at 2 teaspoonfuls daily for an adult. (As capsules or as liquid oil) The best flaxseed oil is cold pressed in the absence of oxygen - this is completely free of bitterness unlike the normally extracted oil - and can even be added to salads and other foods. (There are good quality brands of linseed oil at varying prices - many people take some every day and find it quite delicious! See appendix for details.) However, some research indicates that Flax seed oil is not suitable for children - so the jury is still out on this one. or Borage seed oil capsules contain the omega 6 fatty acid GLA. A very relevant book about oils in the diet is 'Fats that heal fats that kill' by Udo Erasmus. T.N.I. for adults: Experience seems to show that the best results are obtained when T.N.I. is started as early as possible, even in utero via the mother's diet. However, between birth and three months medical advice should be sought. There is little documented evidence with its use for adults. Generally, there are fewer infections, better overall health and well-being, delayed onset of aging, dementia and reduced risk of cancer. While it is quite legal and within anyone's freedom to purchase and use these products, it is strongly recommended to involve a doctor and to have any relevant tests carried out. There are far fewer infections, resulting in fewer days off school. White blood cell count and T cells are normalised. There is often an improvement in speech, gross motor and fine motor coordination and cognition. Intelligence (I.Q.) has been shown to be enhanced by some researchers, but many are wary of making claims in this direction partly so as not to build up the hopes of parents. Some parents report more normal growth, better muscle tone, thickening of hair, more supple skin and some changes of the facial features. Natural verses Synthetic. It may be argued that vitamins and minerals are best taken in through the normal nutrition, where they arise through the natural life processes within the plant and animal kingdom, from which nutrition is normally derived. Vitamins that are synthetically produced in a laboratory, even though they may be chemically identical to those naturally found in food, have been shown to be different with regard to their dynamic qualities. (See Hauschka; 'Nutrition' and 'Nature of Substance.') On the one hand, research has shown that diet alone cannot supply the level of vitamins necessary to normalise the blood levels in Down's Syndrome; the amounts of these substances in the diet are believed to be too low. Companies like Cytoplan and Higher Nature produce vitamins and minerals in a 'natural form' that are claimed to be up to 10 times more bio-available and effective than synthetic forms. It is, of course, important to give a diet that is naturally rich in vitamins, minerals and antioxidants, such as organic or biodynamic fruit and vegetables, that are either raw or at least not overcooked, even though diet alone is unlikely to have the same levels as T.N.I. Foods that are particularly rich in antioxidants are prunes, bilberries, blackberries, cranberries, strawberries, raspberries, raisins, grapes, blackcurrants, carrots, garlic, kale and broccoli. Oils can be added to food if desired, but should not be cooked. It is important to take all supplements with or just after meals. Breast-feed the child for as long as seems appropriate. The mother should consume a good source of DHA (fish oil) and flaxseed oil. Avoid sulpha drugs as they deplete zinc, if they must be used, supplement with extra zinc. There are questions about the level of iron supplementation. Too much iron stimulates the Fenton reaction, which converts cellular H2O2 to OH radical, thus increasing oxidative stress. Hence, iron preparations should be avoided. Avoid supplements with large amounts of folic acid as this can cause hyperactivity. Other similar products include MSB plus from Nutri-chem in Canada, and Nutrivene from International Nutrition in the USA. Addresses can be found at the end of the article. Producers of Nutrivene-D:International Nutrition Inc.
Down's syndrome people in the UK may get exemption from VAT and import duty charged on imported medical items. Contact DTI Customs and excise at 0171 215 5000 (or -4508) and ask for form BFA(BH)89 (Application for relief from Common Customs Tariff Duty - Articles for the blind or handicapped). When the form has been filled in, send to the Customs and Excise office at the place where the items entered the U.K. Note that it is important to retain the customs charge form that will be attached to the parcel, as this shows this address and other essential information.